COLUMBIA, SC – The Second Annual Skate and Create exhibition bridges the aesthetic inspiration of art and the performative creativity of skateboarding. The show, whose name is a play on Thrasher magazine’s “Skate and Destroy” slogan, seeks to turn public perception of skateboarders on its head and to explore unconventional uses of architecture and space. 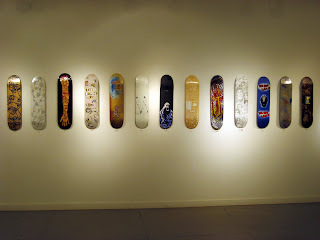 The exhibit is curated by Bluetile Skateshop and hosted by Gallery 80808/Vista Studio artist Susan Lenz. It will open on Friday, October 3, 2008. Admission is free. Just as skateboarders re-envision the urban landscape, artists from Columbia and from throughout the nation will recast skateboarding in new, unexpected ways. 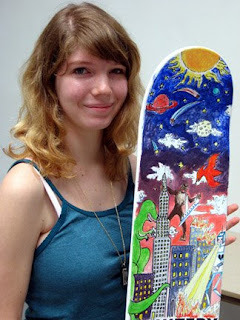 Bluetile Skateshop will provide a skateboard deck to each artist to paint, carve, sculpt and modify. In addition to the skateboard, artists are encouraged to use a diverse array of materials to create a piece that puts skateboarding into new contexts. The connection between skateboarding and art has been highlighted recently by several successful showings, by Mark Gonzales, Ed Templeton and Glen E. Friedman, in major galleries and museums throughout the world. The Beautiful Losers exhibit, a collection of artists with ties to skateboarding and punk rock, has received international acclaim. Proceeds from the sales will go to POUR IT NOW, a 501c3 organization advocating for skateboard parks throughout South Carolina. Bluetile is a skater-owned-and-operated skateshop. It is committed to strengthening the city’s skateboard scene and skate culture. Proprietor David Toole has been active in the effort to rebuild Owens Field skatepark. Gallery 80808/Vista Studios, one of the premier art spaces in Columbia, is a unique concept in galleries. It provides both studio and gallery space to area artists.